Last year, I was invited to appear on the Albuquerque Pride float during New Mexico State Fair’s parade. Not a Pride parade, mind you, but the parade for the State Fair. High school marching bands, politicians, local businesses – all were present, we were the only Pride centric float. Taken out of my Los Angeles safety bubble, I was shocked and immediately put on guard as portions of the parade route would boo us, flip us off, shout out that at us that we were going to hell for being sinners. Perhaps the saddest moment was the image, burned into my memory, of a little boy looking up at his mom flipping us off – he saw what she was doing and in turn, faced us, and lifted his middle finger. He didn’t even know what he was doing, he was just following by example. This is not to counteract the support we did receive and the youth rushing up to the float to get a rainbow sticker. I have MC’d many LGBT events, always in the comfort of a big city. I forget how bigotry can still run rampant and the LGBT communities in smaller towns are fighting the good fight. After a day at the State Fair I needed a drink. I wandered into a local bar and met a spitfire of energy and strength, she was a Drag King… and she was fabulous! 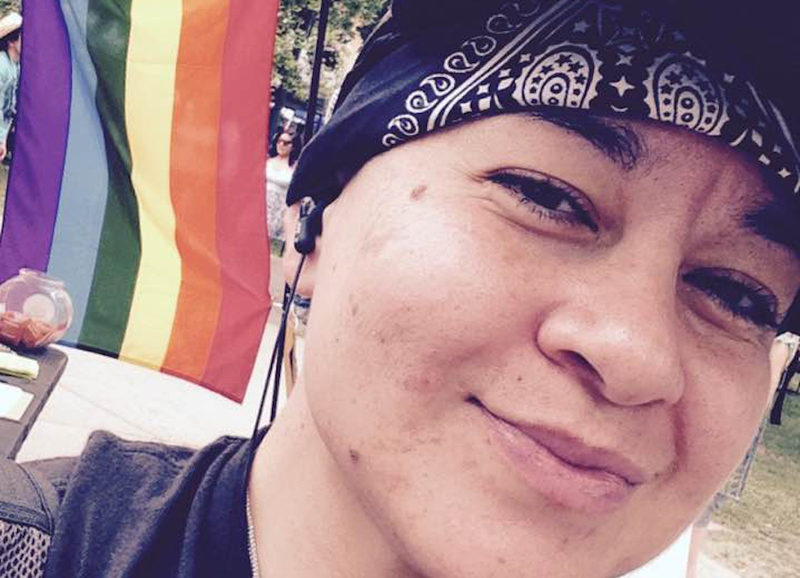 Meet Jaylene Quiles, one of the masterminds responsible for putting on the first ever LGBT Pride parade in her hometown of Las Vegas, New Mexico – a town that has dealt with its LGBT bigotry, but is thriving and hopes to make a splash with this year’s Pride on April 27th. Tell me about the town of Las Vegas, New Mexico. Las Vegas is a beautiful town. With much history and wonderful views of mother nature’s mountains and sights. It also was the hang out of Billy the kid. There’s still family values of love and honor here. From Hot Springs and walking trails, Drive-in theater and a famous castle, we have something special to be proud of. What inspired having the first LGBT Pride Parade here? Everyone has a dream of their first pride parade. The university here in Las Vegas started a club, Prism, that is a safe zone for our GLBTQ students and allies. Co-founder Maysie Bucklin has been working with the university to connect with the community for this beautiful parade. Maysie’s help has been stellar in helping Las Vegas NM get to this moment of opening doors to the GLBTQ community, where it is a safe place to go and receive resources if needed. So, with the help of the club and the president, we got together and decided that the community needs to be more involved to make this an inclusive to all parade, because that’s what Pride means, No Discrimination, and with the resources of the university they decided to get the ball rolling with the protocols of a parade. Why is this parade so important? It is bringing awareness that there are all walks of life, and with the horrible things going on the world today we need to break the stigma where it is okay for someone to hurt someone because they are different. We are people and we have rights like everyone else. Rights may be words, but we are putting them into action. This town is backwards sometimes, in the 1950s kind of way, where people can’t be who they are because you have to follow everyone else’s norm of society. Can’t have broken homes, have to go to the town’s church, have to have ties with people of power in the community and so on. This parade is important because many people are suffering and dying in this town from unhappiness. They are behind doors feeling no one cares and the life they have is the only life they will ever know, which is not true. Life can beautiful with a loving single parent, or Gay couples having children and walk down the street or Walmart store without someone shouting a homophobic word. It’s important to have the parade to bring awareness and safety to our town for the future of our children, where they can have a safer tomorrow and be themselves. What is your relationship with this town? I am from Las Vegas NM and I am currently a local resident. I was bullied here from 4th grade by teachers, parents, peers, coaches, and anybody that didn’t like me because of who I am. I am openly gay and have been the last 17 years of my life. My mom owns a business, The Styling Parlor, where as a woman she got a lot of grief from the town. She’s been in business for over 40 years. A single parent, a woman, and a business owner. She taught me that it was okay to be different. She taught me to stand up for myself. My mom raised me with love and is a beautiful person. My family is from this town. And all I’ve ever wanted was inclusiveness and to be happy. But I grew up being bullied with rocks thrown at me, being jumped by girls who called me Dyke, and being humiliated at any chance other parents, teachers or coaches could get. I went to University of New Mexico in Albuquerque and played rugby and I worked for the USDA, but I came back because I love my town, I do. But this town also hindered my growth as a child and I didn’t want that to continue to happen to other people, including children. I came back to make a difference. Because we know who we are, we don’t need that time for others to tell us differently. I was bullied by people that were supposed to help you, where they were supposed to care. They were adults. I found out that just because they say something doesn’t mean it’s true as a child hears it. I know the battle is tough but it is not a battle to me. I walk with God whoever he or she may be. I walk with love and this town has shown me be unlike your enemies. What was our own coming out story? I think we all wish it would be rainbows and butterflies when we come out. But for me it was the worst pain yet the best kind of unconditional love one could ask for. I had to leave the town because of the hatred of being bullied. So, I went to the University of New Mexico in Albuquerque. A town two hours away. I was 19 when I heard about a gay bar in the town. But I was 19 so I couldn’t get into the bar. I actually scaled the fence which had barb wire and snuck in, every Thursday until I got a fake ID. I wanted to be around people like me and, at the time, the gay bars were the safest place for us to go. Now we have other resource places, but the bars and clubs like Sidewinders and Social club were historical places. I became involved with groups that would come in form the GLBTQ community. But one day I came home crying because a girl broke my heart. My mom was consoling me and didn’t know why I was crying. My little brother who is also a part of the GLBTQ community- walked in and said mom, Jaylene is gay, because I didn’t have the words to say it. My mom looked at me and then hugged me tight and said she loved me. That was the worst yet best feeling a human one can have. To be broken by someone yet held together by someone who actually has the power to break you, while instead my mom gave me strength to understand I wasn’t wrong for my emotions for another woman. I am a person and she told me I was and will always be her child and whom will always be loved. My mom has kept her loving promise. I was very blessed for her to be my mother and role model. She taught me love not hate. How is the LGBT community doing in your part of the world? We are growing in many ways. More resources for our youth, our GLBTQ and our allies. But we still need work in coming together in all of the community. There will always be challenges, but if we show up together with love and respect, we have proven that we can do anything in this world. And our community has grown so much in the last ten years, I’m very proud of our community. We will continue to grow too with the help of each other and others that want to help us in this movement of love. How can the LGBT community help your cause? By helping us make history together in this movement. We need to be stronger in who we are. We need help just like any other movement, with funding, with allies, with inspirational people. The GLBTQ is growing . We have the leather boys club, the leather daddies, PRISM club, PFlag and etc, there are so many resources that can help our children too. They need support in school, counsel, and etc. You have a presence in the community as a very well-known Drag King. Do you remember your first time doing drag? 17 years ago, when I performed at FOXES, PULSE, AMC, Exhale, and Sidewinders. These clubs and bars opened the doors for me to perform. Then I became a New Mexico Title Holder for Pride 2008-09 which is nationally recognized. That year for me was an educational, crazy kind of year. Gay marriage had passed and people were very hateful. That year of the pride parade we had over 40,000 people show. I opened for Tribal Pride, we also had Taylor Dayne come down and it was amazing. I learned about the history of Stonewall and fell in love with my culture. I fell in love with who I was. And for once I felt it was okay to be who I was and to love who I loved, which was everyone like me. I’ve done so many shows and raised way over 20,000 dollars in my work of helping others. Life has been good to me in the drag world. Being a drag king has been a blessing because I reach people – they see the dance and songs I perform and they want to be a part of that freedom. I’m free when I perform as a King. Is there any pushback from the drag queen community to drag king performances? The Drag Queen community has many wonderful performers who’ve helped many kings like myself start a name for themselves. The New Mexico Queens like anyone who love what they do and as long as you respect them, they will always have your back. The beautiful Queens of New Mexico are always amazing, fierce, and loved by myself and many. I learned from the best. My mom loved to dance. She would put on Whitney Houston and we would dance in the kitchen or in the stores. She always has let me be me. Even when I wasn’t me, she was there. She is more than an inspiration. She is a gift from God. Thank you mom, Polly Anne Perea. You saved me. Now it’s my turn to help save others. What does the LGBT community nationwide need to do most during this social and political climate? Stay focused on the main goal. We all are equal. We all want to be who we are and have rights to protect that. We need to remember our culture, our past that leads us to have rights now. The more we segregate each other and put each other down, the more the haters are winning. We need to not just see the GLBTQ, we need to see the heart behind the person. We are stronger in numbers, not being alone. And no one should be alone in this movement. One thing you could tell yourself at age 16: Life is bigger than you can imagine, learn as much as you can wherever you go and always know you are loved. Craziest place you’ve hooked up: Hmmmmm… maybe someday in the future I’ll answer this question! Alexander is the host of iHeartRadio/Here TV's 'On the Rocks Radio Show: Where Celebrities & Cocktails Mix' - Academy, Emmy, Golden Globe, Grammy, Tony and Razzie Award winners, he's drank with them all! Twitter/Instagram: @ontherocksonair or visit www.OntheRocksRadioShow.com for more fun!